Newborn Hope is proud to announce our 2018 grant recipients. 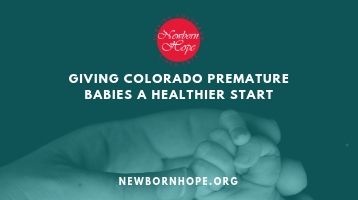 The following organizations work throughout the state of Colorado to increase positive outcomes for pregnant women and premature infants. Arkansas Valley Regional Medical Center (La Junta) Funding towards the purchase of a GE Giraffe Incubator Carestation. Children’s Hospital Colorado Foundation (Colorado Springs) Funding to support the NICU Family Support Program. Children’s Hospital Colorado Foundation (Colorado Springs) Funds to support the Volunteer Task Force Program, a Newborn Hope sponsored program that assists babies and families in the NICU to ease the challenges caused by premature birth. Family Visitor Programs (Glenwood Springs) Funds to provide home-based prenatal education and support for high-risk pregnant women that reside in rural regions from Aspen to Parachute. Inner City Health (Denver) Funds to provide office visits, lab tests, ultrasounds and car seats to medically underserved pregnant women. Mountain Family Health Centers (Glenwood Springs) Funding to purchase two phototherapy blankets to treat newborn infants with jaundice. Parkview Medical Center (Pueblo) Funds to provide human milk to premature infants and to purchase developmental equipment and an ISTAT machine to run labs on critical babies. Penrose-St. Francis Health Foundation (Colorado Springs) Funds to purchase four recliners for use in the NICU. Ronald McDonald House Charities of Denver, Inc. (Denver) Funds to purchase six breast pumps and trolleys, and 24 breast pump kits for mothers of premature infants. Special Kids Special Care (Castle Pines) Funds to support the Safe Sleep Going Home Program for Premature Infants.